Sometimes it seems like the resurrection of Jesus is just mixed in with the Easter bunny and Easter eggs and that makes me uncomfortable. I remember, as a young mother, what the “after Easter slump” felt like. The children were grumpy after their sugar high. Little bits of fractured egg shell were in the carpet. I would find candy wrappers and Easter basket grass in all sorts of secret hiding places for weeks to come. I don’t want to put away the story of Jesus along with the Easter decorations! 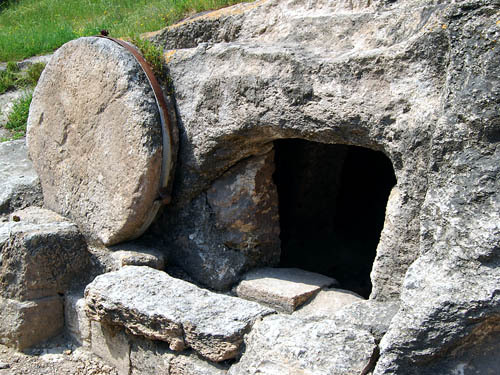 It has occurred to me that the days following Easter are a great time to review the story of the resurrection and talk about the impact this event has on our lives every day of the year. You might notice how shops tend to put all of their Easter decorations on sale after Easter. How about buying a dozen of those plastic Easter eggs (the kind you open and put things inside)? You can use them to review the story of the resurrection. Of course you don’t have to use plastic eggs at all if they are not available. You can just show the items to the children one after the other. The eggs are just easy to use and store away. This idea is not new with me. I’ve listed some sites below that explain some other variations. I will try this with our Sunday school group! They asked for a Easter Egg hunt and I’m going to give them one with this twist! Thank you so much! This is a great idea and takes advantage of the “after Easter slump” (as you put it) and make it into a teachable moment. Thanks.